The REV'IT! 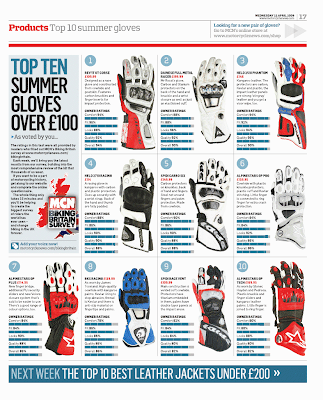 GT Corse Race Glove just received the distinction of being rated the best Summer Motorcycle Glove over €100 by the UK's MCN Magazine. We have yet to cease being impressed with this less than 10 year old brand. Comin in at number 2 was Valentino's glove, the Dainese Full Metal Racer.